Sometimes a new item is too good to be true... and then again.. 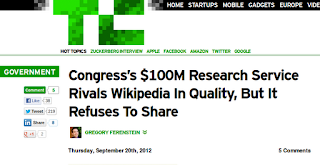 I have no comment about the relative quality of Wikipedia compared to Congress's $100M research service. What I find of interest is the implied value that is put on the quality of Wikipedia. Eh, I assume the value is $100M a year. $100m a year would be a huge disappointment. The value to the world should run into billions per year. With one third of the worlds population on line, eve if the average value is only $1 a year (and as a top 5 website that is effectively the only purely philanthropic venture I would hope its a lot more) that would be well over $2 billion.